SAP : How to Block or Unblock a Vendor ? Use transaction code XK05 to centrally block or unblock all financial or purchasing transaction (or both) of a vendor . To block the posting of all Financial accounting and Material management we can use this option. If Posting block is enabled you cannot post any open items. Purchasing block is used to block all procurement or purhcasing transactions like creating a new purchase order. 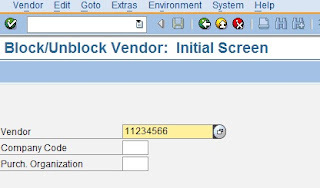 How to block a vendor in SAP ? Enter the Company code and Purchase organization and press enter. In the second screen select one of these options or both (as per your requirement). These are the blocking options available in SAP, select one of these options . 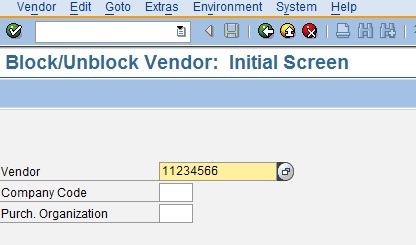 Now press Save button, now the vendor is blocked in SAP. 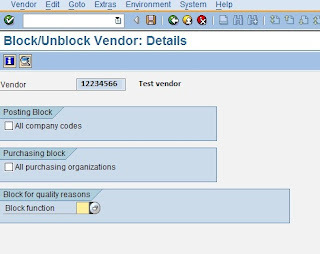 How to unblock a Vendor ? In the second screen remove the tick marks from "Posting block" or "Purchasing block" if exist and also remove the "Block reason" and save .